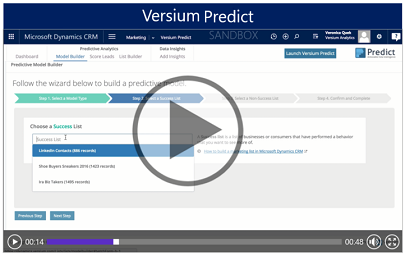 Use Versium Predict in Dynamics 365 (online), version 8.2 to increase your marketing and sales effectiveness. Enhance your existing marketing process with predictive analytics that allow you to precisely target your campaigns. Build Predictive Models: Analyze your marketing lists to create a model of the business or consumer lead characteristics that correlate with desired behaviors with the Predictive Analytics Model Builder. Score leads: Using a predictive model for a specific behavior, you can score a Dynamics 365 (online), version 8.2 marketing list to see who in that list is more likely to do a specific behavior, such as clicking a link in an email campaign. Enhance your lead data: Enhance your marketing lists with additional information from Versium Predict Data Warehouse, such as email addresses, phone numbers, financial information, social network information, and demographic data. Predict Versium is a preferred provider solution that your administrator can add from the Customer Engagement admin center. More information: Install or remove a preferred solution.